The most recognized name in bathing and hot tubs marks occasion with events and promotions throughout the next year. Jacuzzi Group Worldwide (http://www.jacuzzi.com), the pioneers of the first home whirlpool hydrotherapy pump, announces the 60th anniversary of the Jacuzzi® Brand. In honor of the performance, well-being and the history behind the most recognized name in hydrotherapy, the Jacuzzi® Brand will be celebrating its diamond anniversary throughout the next year with in-store promotions, events and more. With a rich history of innovation and design, the Jacuzzi® Brand continues to lead in both indoor and outdoor hydromassage. The Jacuzzi brothers revolutionized the pump industry by developing a pump that drew water out of the ground more efficiently than ever before, earning them a Gold Medal Award at the California State Fair in 1930. 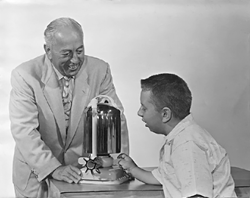 Then in 1956, Candido Jacuzzi responded to his toddler Ken’s need for pain relief and created the J-300™ hydromassage pump. The portable hydrotherapy pump turned any normal bathtub into a relaxing and rejuvenating hydro-therapeutic spa and changed the lives of people around the world. While the demand for the J-300™ pump was strong, Jacuzzi soon became a household name thanks in part to repeated appearances on the national daytime television show, Queen for a Day, which boasted 20 million viewers. During that time, the Jacuzzi® Brand became an overnight sensation, even with famous names such as Elvis, Marilyn Monroe and George Burns all owning Jacuzzi® Products. Over time, the Jacuzzi® Brand advanced and adapted products to make in-home hydrotherapy available to anyone, from bringing the world’s first integrated whirlpool bath to the market to units with built-in heating and filtration systems that accommodate groups of people, both indoors and out. Today, Jacuzzi® Brand hydrotherapy is available in many forms, including the award-winning Siena™ Freestanding soaking bath and the revolutionary J-500™ Collection of portable hot tubs. And while the technology of hydrotherapy has changed over the years, the benchmark for performance, design, care and well-being has always been at the core of the Jacuzzi® Brand. Jacuzzi Luxury Bath will have a multi-faceted presence at the MA! Design is Human and Architectural Tour in Atlanta, GA, from June 8 – June 12, 2016. The Stella™ Bathtub will be on display in one of the Architectural Tour homes, the Bianca™ bathtub will be displayed at the MidExpo, and several other baths can be seen at the Ferguson Bath, Kitchen & Lighting Gallery at The Shops at Buckhead. Jacuzzi Luxury Bath will take advantage of this opportune time and location to celebrate its 60th Anniversary with an exclusive Designer-, Architect- and Builder-focused event in the Ferguson showroom on Thursday, June 9, 2016. “Since Jacuzzi manufactures its products in Georgia, Atlanta was the perfect place to celebrate our 60th Anniversary with key industry influencers”, states Joseph Davis, President of Jacuzzi Luxury Bath. “We want to share the legacy of our brand and how the company has transformed during the last six decades to become more relevant than ever to the design community,” adds Erica Moir, VP of Marketing and Engineering. A CEU titled “Designing the Bathroom as a Wellness Retreat” is also hosted by Jacuzzi at ADAC in partnership with MA! Design is Human on June 9, 2016. Jacuzzi Group Worldwide, through its subsidiaries, is a global manufacturer and distributor of branded bath and hot tub products. Backed by 60 years of product engineering, Jacuzzi is committed to creating products that focus on health and wellbeing through Jacuzzi® Aqualibrium® — the perfect mix of air and water. Learn more at http://www.jacuzzi.com or contact us at 1-866-234-7727. Ferguson (http://www.ferguson.com) is the largest wholesale distributor of residential and commercial plumbing supplies and pipe, valves and fittings in the U.S. The company is also a major distributor of HVAC/R equipment, waterworks and industrial products and services. Founded in 1953 and headquartered in Newport News, Va., Ferguson has sales of $13 billion and approximately 22,000 associates in 1,400 locations. Ferguson and its subsidiaries serve customers in all 50 states, Puerto Rico, Mexico and the Caribbean. Ferguson is part of Wolseley plc (http://www.wolseley.com), which is listed on the London Stock Exchange (LSE: WOS) and on the FTSE 100 index of listed companies.